The land where Kensington is located was owned by Peter and Anna Greta Johnson, who had purchased it from early homesteader, Nils Ristburg, in Solem Township, Douglas County in 1882. The Johnson farm changed quickly in August, 1886 when Peter sold a strip of land running diagonally through his farm to the Minneapolis and Pacific Railway Company for a rail line to be built. Then on November 4, 1886 Johnson sold a portion of the farm to William D. Washburn for the surveying and platting of a village when a railroad station was located here. The plot was recorded in 1887. Washburn sold the original platted townsite to the Pacific Land Company with lots ready to sell for businesses and residential houses to be built. A railroad worker, Mr. Maxfield, saw a beautiful flower garden in the area which reminded him of the famous Kensington Gardens in England and suggested the village be named Kensington. The lots in the new town were sold quickly and construction activity was brisk as additional settlers arrived to establish their businesses and homes. Those pioneering businessmen organized the village government, laid the ground work for a school house and church, and invested in other business enterprises. Kensington celebrated its Centennial in 1990. Ten village residents compiled, wrote, and published “Kensington’s First 100 Years”. The book outlines the early settlement of the area, development of the area townships and village, contains descriptions of many of the businesses, and profiles many of the area families. For more information visit the Kensington Heritage Society website. In l898 when the ten year old son of Olof Ohman, who was farming two and half miles northeast of Kensington, found strange markings on a slab of rock that had just been pried out of the ground. The son, Edward, called his father’s attention to the stone. The father, who had been clearing trees and rocks from a level space on top of a hill 40 feet above the surrounding low land, saved the stone, and later showed it to prominent citizens in Kensington. No one was able to completely decipher the stone, until nine years later when Hjalmer R. Holand, a University of Wisconsin graduate student with a major in history, heard of the stone on a trip to Kensington. 8 Goths and 22 Norweigans on exploration journey from Vinland over the west. We camp by 2 skerries one day-journey from this stone. We were and fished one day. After we came home, 10 men red with blood and tourtured. Hail Virgin Mary, save from evil. Have 10 men by the sea to look after our ship, 14 day -journeys from this island year 1362. The translation of this stone sparked an international search to find out if it could possibly be genuine. The Minnesota Historical society appointed five scholars to investigate, and after a year and half of work reported the stone genuine. 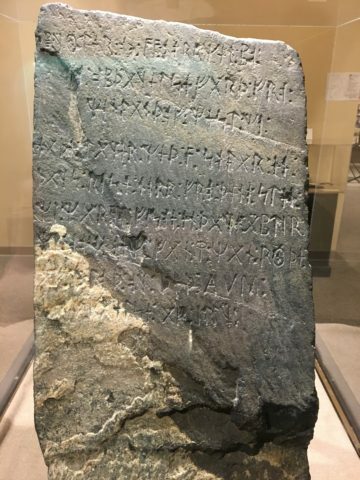 The Kensington Runestone is 31 inches high, 16 inches wide, six inches thick and weighs 202 pounds. Navigator for the crews was Nicolas of Lynn, an English astronomer who was known throughout Europe. He brought the small ships safely to Iceland, Greenland Rhode Island and Hudson Bay. While the main party went south looking for a safer way back to New England than the bitter cold northern route, he mapped the whole of Hudson Bay and discovered, for the first time in history, the magnetic North Pole. The sons of Columbus said the discovery of islands in the west by Lynn, was one of the factors which encouraged his father to try the southern route to America. A map by John Ruysch, dated 1508, refers to the discovery of the magnetic North Pole as an accomplished fact. In 1537 a map was published of Hudson Bay showing the discoveries of Lynn, which included such details as spring thaws which flooded to the north. 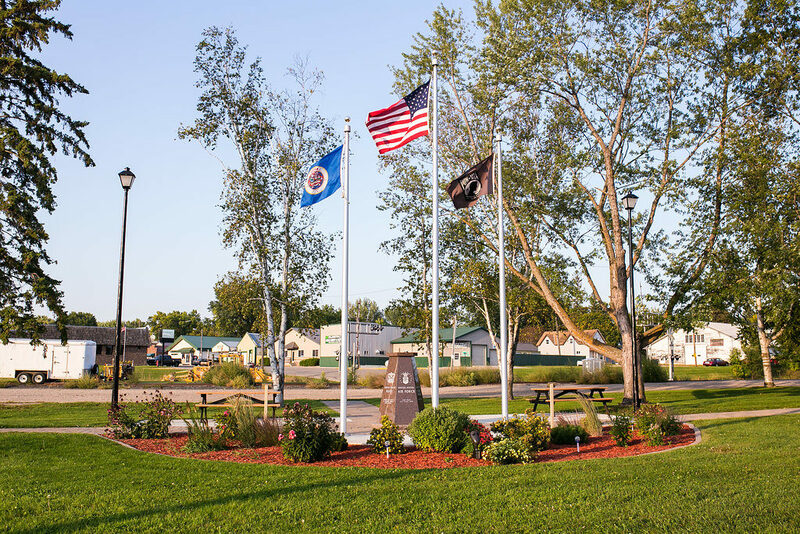 A series of 15 campsites have been found, running from Hudson Bay to Sauk Centre, Minnesota. The Norsemen, as is still the case in Norway, cut triangular holes in convenient rock ledges to which to fasten anchor pins for their boats. Because the Indians or early settlers to Minnesota did not use such type of holes, these mooring holes are distinctive and have not been molested. They are so old, the rain and sand have worn the tiny chisel marks on their inner surfaces smooth. Several have been found at projected intermediate places along the route. There are a number of actual 1362 period Norse instruments, which have been taken to Europe and found to be identical with similar instruments in the Nordic museum near Stockholm and other museums. These instruments have been found in no other place in the North American continent showing they could not have been brought to this country by settlers. These instruments include a firesteel for making fires; a ceremonial halbred signifying a royal expedition; a heavy battle axe with a 16 inch cutting edge; a light battle axe, used for fighting men in armoured suits; a spear head; a Nordic sword, and other relics which include mooring stone pins. The Verendrye Runestone was found in 1783 near Minot, North Dakota. It was fitted into a pillar, had runic markings on both sides and was about 5 inches wide and 13 inches long. Indians who were asked about the stone said it had been part of the pillar since time immemorial. Verendrye, a French explorer, took the stone to eastern Canada, where it was studied by Jesuit priests, and then he took it to France where it became lost. The Minnesota Historical Society has offered a $1,000.00 reward for its rediscovery. Mr. Holand says it may well have been found in Mandan territory and that it may carry an additional message from the Norsemen who lived out their lives with those Indians. There are blue-eyed Mandan Indians who knew about Christianity before the first settlers arrived, and who lived in square medieval-Norwegian design buildings. It is believed that the main party which went south from Hudson Bay had a special religious service at Sauk Centre at a huge stone alter there and then turned back north to rejoin their comrades. However, due to accident, fire, error in judgment, or unexpected severe fall headwinds, they were unable to return in time to go with Lynn on his return back to Europe. So, they cast their lot with the Mandan Indians, widely known for their noble mode of life. This article uses materials from the Kensington Heritage Society.